For the bookworms among us, it’s safe to say there’s nothing quite like sitting down with a good book at the end of the day and getting lost in another world for a few hours. But what if you didn’t have access to the stories that made your childhood or those that brighten up even the darkest days? Sometimes the written word cannot be accessed by everyone such as those that are visually impaired or illiterate, so how can we get our well-loved stories to them. Someone who experienced the difficulty (before e-books became a possibility) was Darren Paskell, who attended university as a blind student. So he could get hold of his course texts, he often “found himself on the phone to publishers asking if they could send electronic versions from their office files.” This wasn’t always possible so he would sometimes be forced to scan the books himself into digital form which could take up to 12 hours a week. It is often said that there’s something great about the feel of a book in your hands but what if you can’t read the words on the page? This is where e-books come into the picture. Before now, you may only be aware of the e-book with regards to Kindles and the like, downloading hundreds of books onto a device to be able to take them with you with little trouble. But there are other ways in which e-books can be useful. When a book is digitised, it can be applied to screen-reading software on the computer and text-to-speak functions on handheld devices so that visually impaired people can listen to it. E-books can also make reading easier for partially sighted people because the technology gives them the option to increase the brightness of the device and the size of the font to a preferred size. While the debate about whether the e-book can replace the real book continues, the e-book will continue to be invaluable in promoting equality and inclusion across the population. 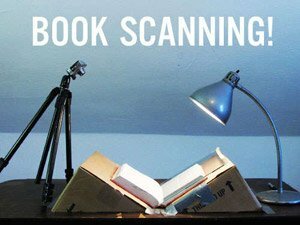 We are a book scanning company and here at Pearl Scan we offer great value book scanning services so if you have a hard copy of your book and you would like to make it accessible to everyone, get in touch today and request a quote for our book scanning services. You can rely on our experienced staff, don’t leave it to people like Darren to scan the books they need for 12 hours a week when we can have it done in no time and converted into the format you need.